Mantua was a small, damp, malaria-plagued town, but it occupied a strategic position along the route linking Italy and Germany. From 1327 it was under the control of the landowning Gonzaga family. Ludovico Gonzaga, who became marquis in 1444, served as condottiere for many more powerful cities, including Milan, Florence, Venice, and Naples, and was an astute politician. He also launched the transformation of Mantua into a center of Renaissance culture. Ludovico’s first major commission seems to have been awarded around 1447 to Pisanello, leading artist of the international Gothic style. Rich, ornate, and decorative, the style held great appeal for aristocratic patrons. In Mantua, Pisanello began work on frescoes illustrating Arthurian legends, but they were never completed. Within a decade or so, Ludovico’s tastes had radically changed. He left behind the Gothic style in favor of the classical language of ancient Roman art. The Gothic style may have been more “modern,” but it was also increasingly outdated. The shift placed him and his court in the vanguard—culturally—in a way he could not achieve in political or military realms. 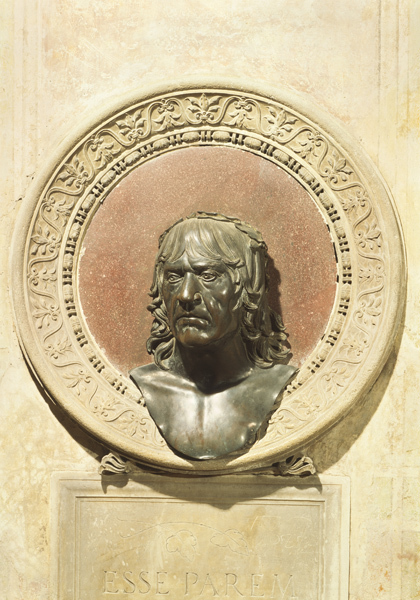 This striking bust of Andrea Mantegna, who was known mostly as a painter but who also made sculpture, is part of his own funerary monument. He filled the monument with references to ancient art. The bust, a Roman form made of bronze, the noblest material of ancient sculpture, is set in front of an ancient porphyry disk within in a round frame. The effect recalls Roman clypeate portraits. The inscription, in Latin, reads, “You who see the bronze likeness of Aeneas [sic] Mantegna know that he is equal if not superior to Apelles.” Not only does it draw a parallel to the most celebrated painter of ancient Greece, but the artist’s own name, Andrea, is altered to match that of Rome’s greatest mythological hero. That the artist was given permission to install his funerary chapel inside the church of S. Andrea is an indication of his standing with the Gonzaga. The medieval monastery had been transformed by Federigo and Alberti into a splendid Renaissance building. Mantegna purchased land behind the church so that no future building would block the light that fell into the chapel through a circular window. Perhaps Ludovico was swayed by the humanist interests of Pius II during the pontiff’s stay in Mantua in 1459–60 (discussed earlier). The pope was then setting out to transform his birthplace into an ideal Renaissance city (renamed Pienza). Influence in that direction must also have come from architect and theorist Leon Battista Alberti, a member of the papal entourage. Later, Alberti worked closely with the marquis on projects that gave Mantua splendid Renaissance edifices and harmonious public spaces. Ludovico’s new tastes were in evidence by 1460, when he lured Andrea Mantegna, widely recognized for his “archaeological” style, to Mantua as court artist (see Mantegna and the Court Artist). Mantegna studied Roman reliefs and sarcophagi to glean authentic details and worked with scholars to learn more from ancient histories by Plutarch, Appian, and Suetonius. His archaeological approach is apparent in a series of paintings illustrating the triumph of Caesar. 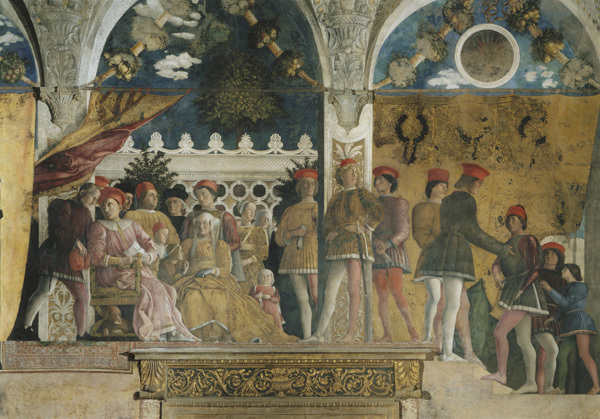 For some period in the 1490s, the paintings were used as theater decoration, but their original location and the details about who commissioned them remain unclear. It was likely Francesco Gonzaga, or perhaps his father. The paintings were acquired by the English king Charles I in the early seventeenth century. 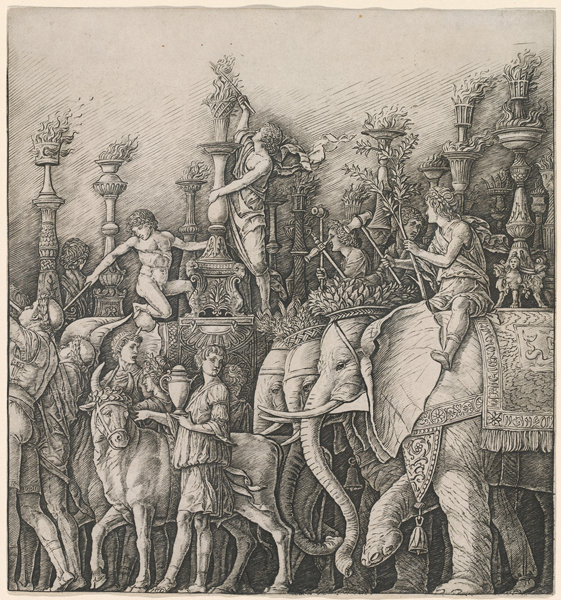 Before they left Italy, however, they were widely copied and reproduced in prints, helping establish Mantegna’s reputation. When he agreed to work for the Gonzaga, Mantegna was given lodging for himself and his family, annual stores of food for six, firewood and other supplies, and fine crimson cloth for his livery. His initial salary of 180 ducats a year placed him in the same financial position as a prosperous merchant or skilled tradesman. Ludovico was apparently not always prompt with payment and sometimes compensated Mantegna with grants of land in lieu of cash (read Mantegna’s complaint to his patron. Except for a couple of years spent in Rome, Mantegna remained in Mantua the rest of his life, serving three generations of Gonzaga patrons. The court artist’s salary was not a payment for works produced so much as it was a reward for his talent and invention. Wages could vary widely: Pisanello was paid 400 ducats a year when he worked in Naples, but Cosmè Tura received only 60 in Ferrara. Rulers also sometimes paid the dowries of artists’ daughters and made other financial arrangements.